This sounds like a really well written and interesting book. I love historical murder mysteries! This book actually seems really great – I feel like I’ve seen it before, but I don’t think I have it. I’ll have to keep an eye out for it. Ooooh, this one sounds good. I have been on the lookout for literary mysteries recently and this one looks like it fits the bill! This one has been on my want list for some time. I’m glad you liked it! There is nothing quite like a good true crime book. And to think, the only negative thing you could say is that the author didn’t have any more books! That is a complement if I’ve ever seen one! I read this and like you, can’t wait to see what she comes up with next. Sounds really, really good Jen. I actually didn’t read this BECAUSE it was set in the US, and like you, I (for some odd reason – bc I, too, actually really love US history) don’t tend to love hist-fic that takes place in the States. But living in NYC, I could totally see myself sitting in a coffee shop down on Bond St. digging into this. Also didn’t realize that this was based on a true story. Will have to check it out next time I’m at the bookstore (so, like, tomorrow :). I have this on my TBR. I might need to move it closer to the top of the list. I’ve been wanting to read this one for a while now. I’m even more psyched to get my hands on it now. Thanks for the review. I have this here in my TBR. I’m so glad you enjoyed it. 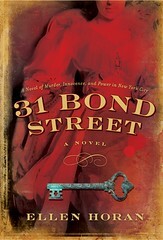 I usually like US historical fiction, so if this one grabbed you, I bound to like it too. I don’t think I loved it as much as you did, but I enjoyed it very much. I loved the ambiguity – is she a social climber? a murderer? a victim? I was also intrigued by the fact that it was based on a true story – that’s always a plus.